I have already posted Sabudana kichidi here, this is a version of south indian version of sago upma. I have given thsi recipe for Kungumam thozi last year themed No onion no garlic recipes . 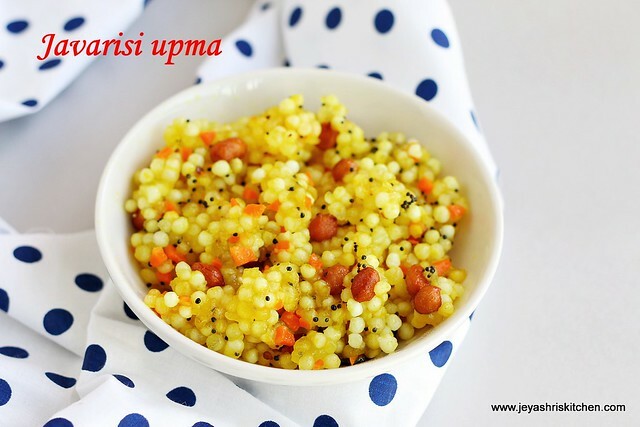 This upma can be made so easily and a pacca bachelor recipe too. If the sago is soaked prior then the upma will be ready in 15 minutes. Last week i made this for me and my hubby for breakfast and clicked too. 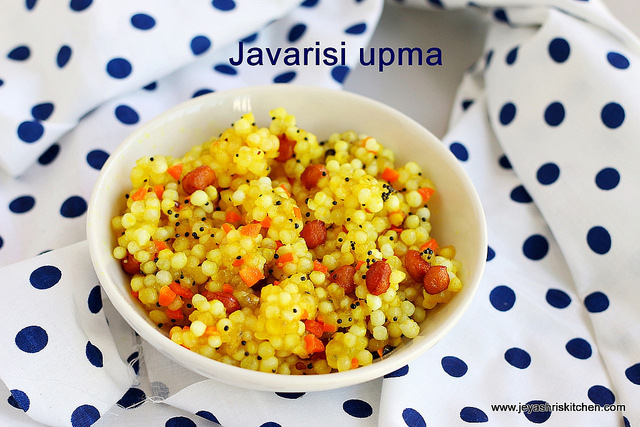 So sharing today the recipe of javarisi upma. Check out my sabudana vada too. Wash the javarisi | sago nicely and soak it in little water , just to immerse it, for 1 hour. Later drain the water and keep it in a colander. Sprinkle little water and keep it overed for 2 hours. You can skip this step but this will be perfect . Mix the turmeric powder with this soaked sago, so that while cooking it will be evenly mixed. In a pan add oil and mustard seeds, peanuts and chopped green chilis. Add the finely chopped carrots(if adding). Even adding peanuts is optinal but i love to add in upmas. Add the soaked and drained sago to this and cook in a very low flame. Cook for 5 minutes in a low flame without getting it burnt. The sago will turn glossy. Be careful not to form it into a lumpy mass. Switch off the flame and add the lemon juice to this. Mix well. Add curry leaves. Serve this always hot, else it will become soggy. 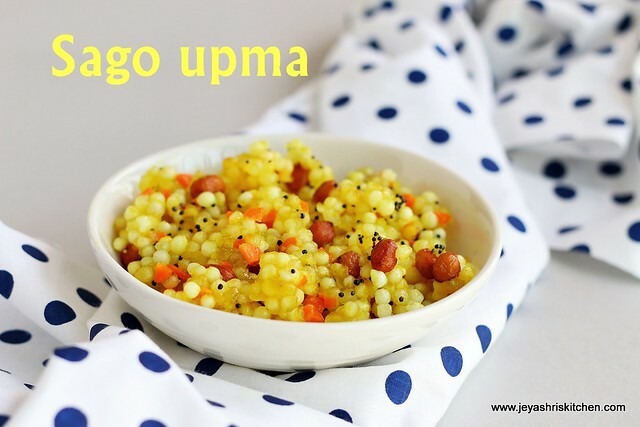 Do not soak the sago in more water , this will make the upma soggy. Overnight soaking is also ok. ensure you add less water only. You can add finely chopped capsicum also if you want. Peanuts can be replaced with cashewnuts too.